Ready to schedule your consultation with Wilmington Dental Studio? Contact our cosmetic dentist today, we’d be happy to get you added to the schedule. Dental veneers are a cosmetic dentistry treatment option that utilizes thin shells (often made from porcelain or composite) which have been designed to look just like a natural tooth crown. 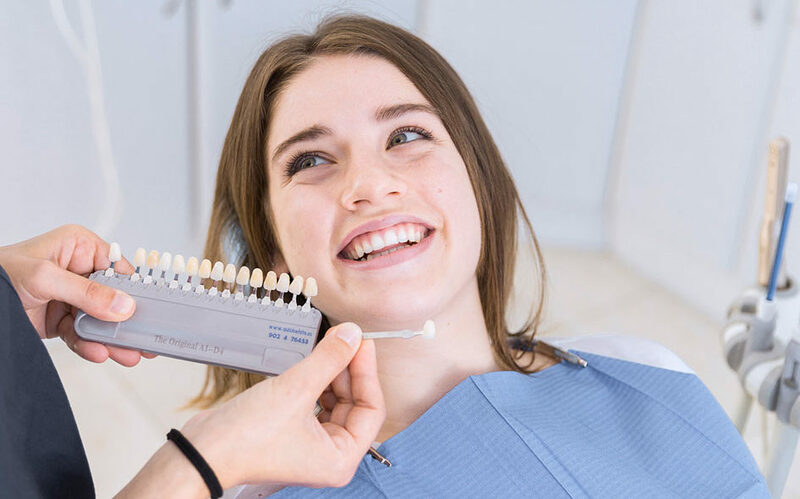 Prior to placement, your dentist will help you select the perfect shape, size and color of your new pearly whites, ensuring that you have the perfect smile. Dental veneers require the teeth to be prepared prior to placement. Your dentist will actually remove minor portions of enamel and tooth structure to ensure that the veneers sit flat and look as natural as possible. Once teeth have been prepared, the dental veneers are bonded directly to the front of the teeth, completely concealing any imperfections. Dental veneers are designed to look just like real teeth, making it a very discreet treatment option. Dental veneers are versatile and can be used to treat a range of imperfections. Dental veneers created with porcelain are actually stain resistant, leaving the patient with a bright, white smile for years to come. Get Wilmington Dental Veneers Today! Ready to improve the appearance of your smile with dental veneers in Wilmington? Contact Wilmington Dental Studio today to schedule your consultation.